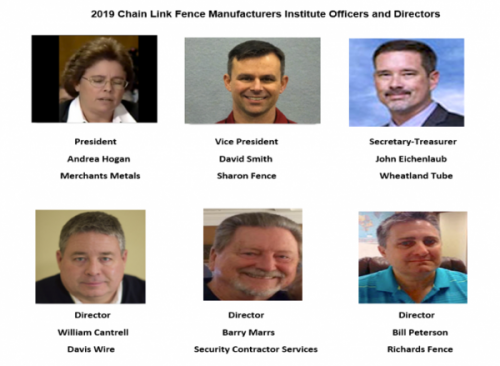 The Chain Link Fence Manufacturers Institute, the association, based in MD which represents 85% of the production of chain link products in North America, has announced its 2019 list of officers. (February 14, 2019) Columbia, Maryland — The Chain Link Fence Manufacturers Institute (CLFMI) has announced the election of three industry leaders to its top volunteer positions for 2019. Elected as CLFMI President for 2019 is Andrea Hogan, CEO of Merchants Metals, Atlanta, GA. For over 60 years, Merchants Metals has offered the industry’s largest selection of premium-quality fence product solutions for industrial, commercial, high-security and residential applications. Ms Hogan is the first female President in CLFMI’s 59-year history. Prior to her appointment as Merchants Metals CEO, she was Vice President for Bidwell Resources and Vice President and General Manager for WESCO International. David Smith, President of Sharon Fence Company, Sharon, PA, will serve as CLFMI Vice President this year. Smith, who served last year as the Institute’s Secretary-Treasurer, is a graduate of the U.S. Naval Academy. The 2019 Secretary-Treasurer is John Eichenlaub, Vice President – Fence for Wheatland Tube, the industry’s largest producer of chain link framework. He was previously the Chief Operating Officer for Builders Fence Company. The three officers were joined on the CLFMI Board of Directors by William Cantrell of Davis Wire Corporation, Irwindale, California, Bill Peterson, of Richard’s Fence, Akron, Ohio, and Barry Marrs, President, Security Contractor Services, North Highlands, CA..
Chain Link Fence Manufacturers Institute is the leading organization of chain link fence manufacturers in the US, Canada and Mexico. A list of Chain link manufacturers, engineers, architects and specifiers is available on the website directory. A list of industry publications such as the new High Security Fencing Guideline, the CLFMI Product Manual, the Field Inspection Guide, and the Wind Load Guide for the Selection of Line Post Spacing and Size are also available under the technical information page. For more information about Chain Link Fence Institute please visit https://chainlinkinfo.org or contact Mark Levin via the website contact form or call 301.596.2583.